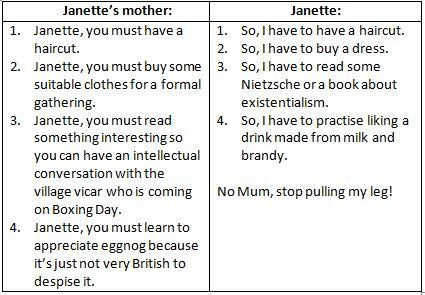 Modal Mania: It’s an obligation Janette: You MUST, You HAVE TO. Well, my plan is to avoid going back to the UK for Christmas so I don’t have to do any of the above. Furthermore, I would rather slit my own wrists and cut out my tongue than drink eggnog. Eggnog is for nutjobs and dairy lovers! Seriously, what’s the problem with looking like a scarecrow, talking about my new favourite Spanish sitcom, ‘Gym Tony’, and drinking vodka? Posted on Aug 8, 2017 Jul 22, 2017 by Inglés MálagaPosted in Grammar, ReadingTagged aprende ingles malaga, modal verbs, obligation. Next Next post: Modal Mania: Janette’s hosting a dinner party. She had better? Hi, my mother used to pumper me like a hen with our chicks and I had to do far-fetched things,.when I went back on holiday. However, nowadays I am the mother!! and, of course, my sons HAVE TO do a long list, then I will be over the moon. Hi Juanabeach, you have just made me laugh my pants off! ´´Pumper me like a hen with our chicks´´ Is that a new amazing Spanglish expression? In English, we have an expression: to hen peck, which means to continually criticise and order about. However, truth be told, I am crazy about your expression, it´s BRILLIANT! With regards to you being a mother, yes, boss your children about, I´m sure they deserve it. I am over the moon with you!